Originally ordered by The Admiralty (Ad.No.4410) as a “Castle” class to be named RICHARD BANE but cancelled. 23.3.1920: Launched by Cook, Welton & Gemmell Ltd, Beverley (Yd.No.426) for Neale & West Ltd, Cardiff as KYOTO. 9.1920: Registered at Cardiff (CF65). 9.1920: Completed (Wilfred Neale, Morley H. Neale & Joshua S. Neale, managers). 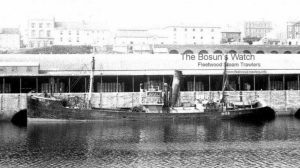 12.1929: Sold to Hakin Trawling Co Ltd, Milford Haven (Joseph S. Pettit, Frederick Steer, Horace S. Fiddy, Milford & Joseph B. B. Huddlestone, Hakin) (Joseph B. B. Huddleston, manager). 16.12.1929: Registered at Milford (M50). 15.3.1937: Sold to Westward Trawlers Ltd, Milford Haven (Edgar E. Carter & Richard S. Bowen, Port Talbot) (Edgar. E. Carter, manager). 18.5.1938: Registered at Milford as RUDILAIS (M50). 5.10.1938: Sailed Milford for fishing grounds (Sk.John F. Jones). WNW strong wind went to anchor in Dale Bay. 6.10.1938: Swinging collided with SHAMA (M223), causing damage. 1.9.1939: Requisitioned for war service and designated for minesweeping duties (Hire rate £91.13.0d/month). 30.9.1939: Last landing at Milford. 1.10.1940: Requisitioned for war service and fitted out for minesweeping duties (P.No.FY.528). 10.1948: Sold to Wyre Steam Trawling Co Ltd, Fleetwood (Merchants (Fleetwood) Ltd, managers). 11.1948: Registered at Fleetwood as WYRE CORSAIR (FD287). 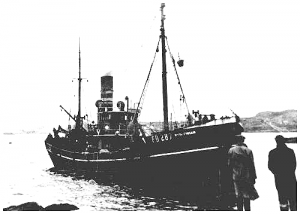 8.1.1949: Sheltering in West Loch Roag, Isle of Lewis in gale force winds, dragged anchor and stranded. Gale gusting 60mph, came afloat and shifted position to anchor. 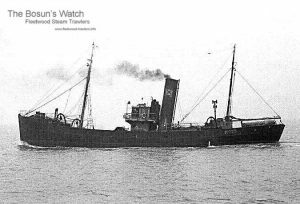 10.1.1949: At about 5.00 p.m. dragged anchor and stranded again; crew of thirteen rescued by breeches-buoy after Stornoway lifeboat had put a line onboard. 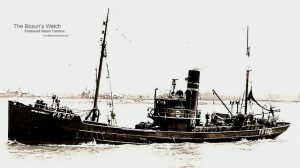 12.1.1949: Refloated by Clyde tug FLYING FALCON (283grt/1934) and delivered Stornoway. 1954: Transferred to Wyre Trawlers Ltd (Leslie Wheildon, manager) on purchase of Merchants (Fleetwood) Ltd by Associated Fisheries Group. 1956: Sold to B. J. Nijkerk S.A., Antwerp for breaking up. 19.4.1956: Sailed Fleetwood for Antwerp. 24/01/2009: Page published. 4 updates since then. This entry was posted in Steam Trawlers, Steamers (Picture) and tagged Castle, Wyre on January 24, 2009 by Fred Smith.